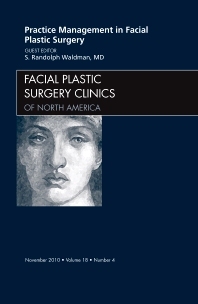 This publication deals with practice issues in Facial Plastic Surgery. Top consultants to cosmetic surgeons present topics of absolute value in the current economy. Topics include: Creating a Culture of Accountability in the Office; Office Managers’ Forum; The Art of the Successful Consultation; Electronic Medical Record - Something to Consider; Establishing a Profitable Skin Care Practice in a Plastic Surgery Office; 9 Worst Advertising Mistakes; The Value of One Patient; 5 Secrets to Leveraging Maximum Buying Power with Your Media Project; Auditing your practice: Non-financial variables to survive, or thrive; Showcase your service: Social Media and Marketing Basics in a Dynamic, Over-Populated, Mixed-Message, and Highly Competitive World; Retailicine, Somewhere Between Retail and Medicine; Shifts Happened - Time to Optimize your Practice; Essential Marketing Tips: Build Your Own Brand one Step at a Time; Being a Responsible Leader; Tips to Get You Busy; Internet Marketing.